$37.285 million on 3275 screens. In a summer packed with sequels and films based on established properties, 2013’s Pacific Rim provided something unusual: a movie that came from an original idea. While I enjoy a lot of those sequels and films based on established properties, I admit it’s a sad state of affairs when it becomes so remarkable to find a potential blockbuster that only exists as a new movie and not a book, TV shows, comic book, toy or earlier flick. Apparently US audiences didn’t know what to do with Rim, as it disappointed at the box office. International movie-goers better embraced it, so the $190 million film eventually approached profitability, but it fell far short of expectations in the States, where it barely crossed the $100 million threshold. As I write this in early October, it stands as the 22nd biggest US hit of 2013, so I doubt it’ll remain in the top 30 by the end of the year. The film’s box office sluggishness surprised me, as I thought it looked like something that should’ve attracted a big audience. It’s robots! It’s monsters! They fight! How could that not soar? Out of nowhere, monsters called Kaiju emerge from the sea and lay waste to various Pacific territories. To combat these, humans come up with a program called “Jaegers”: these are huge robots that require two pilots for operation. The Jaegers manage to turn the tide and largely eliminate the Kaiju peril – for a few years, at least. Eventually the Kaiju return with an unprecedented ferocity and brutality, and the Jaegers prove unable to handle the burden. This leaves the program in tatters and humans desperate for alternate methods to battle the monsters. These tactics don’t seem particularly successful. At a desperate hour, the Jaegers get one more chance, and mismatched pilots Raleigh Becket (Charlie Hunnam) and Mako Mori (Rinko Kikuchi) form the team with the best hope at success. As I wrote that synopsis, I left out some details, but honestly, I could’ve omitted many more and it really wouldn’t have mattered. I wasn’t even sure I needed to bother with character names, as the humans remain essentially inconsequential. Rim exists to show us big, loud, violent scenes of robots as they battle monsters – game, set, match. This doesn’t mean Rim fails to attempt to develop the human characters – it just fails to do so in an even vaguely involving manner. Indeed, very little that occurs in Rim rises above the level of predictable and cliché. Had most other directors made Rim, I wouldn’t feel especially bothered by the film’s lack of personality and obvious depth, but with the talented Guillermo del Toro behind the camera, I expected more. And in a way, it does deliver more; a traipse through this package’s bonus materials reveals that del Toro put intense thought into virtually every facet of the movie and layers of meaning reside in all areas. Unfortunately, those layers remain in the background and do nothing to make the characters and story seem original or creative. It’s great to know the subtle references and meanings del Toro put into design elements, but when they serve a tale that feels like warmed-over Transformers, they can’t do much. 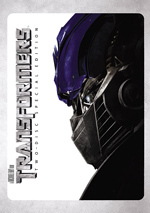 Yes, I used the “T”-word, as I suspect many who saw the ads for Rim initially confused it for another Transformers film. In this day and age, it’s tough to make a movie about giant battling robots and not evoke connections to that series; del Toro’s use of enormous monsters does little other than make Rim feel like a crossover between Transformers and Godzilla. And a fairly unsatisfying one at that, partially because it just seems so darned derivative. Rim makes frequent allusions to other films, and not just the obvious Japanese forebears or Transformers. You’ll see numerous others evoked here, from Star Wars to Blade Runner to The Abyss, and the film doesn’t make these references seem subtle. In fact, Rim so often takes from its predecessors that I started to wonder if it intended to parody the action genre. By channeling his inner Michael Bay, maybe this was meant to be del Toro’s way of mocking that director. I don’t think that’s the case; indeed, the supplements make it clear del Toro meant the film as a love letter to the genre. Still, it becomes tough to reconcile my notions of del Toro’s creativity and the dull, generic characters/story he presents here. Make no mistake: there’s virtually nothing remarkable or fresh about the narrative or participants. Like I mentioned earlier, I thought it was barely worth identifying any of the humans, as none of their stories matter. The movie thinks that we’ll care about Raleigh, Mako and the others, but we don’t. They’re all presented as such bland ciphers that it occasionally becomes tough to remember which rugged white guy is which. (Hint to filmmakers: try to make all your main characters look different!) We don’t worry about their fates because we never invest in them in the first place. Even the action scenes lack the expected punch. It doesn’t help that we spend a fair amount of the movie away from the battle; believe me, added time with Raleigh and company doesn’t make them more involving. When the fights do occur, they’re moderately exciting but not as impressive as they should be; they possess a few cool bits but little to dazzle. Rim does boast one standout scene: a flashback to a traumatic Kaiju-related moment in Mako’s childhood. For a few minutes, the film lives up to expectations, as it provides the drama, power and emotion I figured we’d get throughout a del Toro film. It’s a strong sequence, abetted by an excellent performance from Mana Ashida as young Mako; she delivers the only impressive acting in the whole film. Unfortunately, this scene stands alone and doesn’t have siblings with equal weight. At least the movie looks great, so I can tell that all of del Toro’s work ended up with a simply gorgeous movie. Every scene impresses with detail and depth, as the scenes show enormous visual impact. The film cost a ton of money but the production design indicates that those bucks wound up on the screen. Too bad Rim came with a 10-cent script. Truthfully, Rim isn’t a bad movie, and if Michael Bay had made it, I’d probably view it in a somewhat more positive light. But only somewhat, as even the lowered expectations that come with Bay’s credit can only go so far. Pacific Rim has the potential to be a dynamic, dazzling action film but it devotes too much efforts on visuals at the expense of characters and story. Trite and predictable, the movie fails to impress. 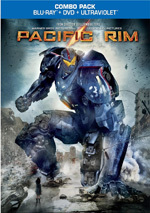 Pacific Rim appears in an aspect ratio of approximately 1.85:1 on this Blu-Ray Disc. The movie looked great at all times. At all times, sharpness appeared positive. I thought the image seemed accurate and well-defined from start to finish, with virtually no signs of softness on display. I noticed no signs of shimmering or jaggies, and the movie lacked any print flaws. Like most other modern action flicks, Rim favored stylized colors, and as usual, those colors tended toward teal and orange. Actually, the palette broadened as the film progressed, so while it stayed heavily stylized, at least more red, blues and greens emerged. Given the visual restrictions, the colors looked positive. I felt just as pleased with the impressive DTS-HD MA 7.1 soundtrack of Rim. A movie packed with mayhem and action, the mix used all the channels in a lively, involving manner. Vehicles, weapon-fire, monsters, robots and similar elements popped up from all around the room and delivered a smooth, engrossing soundscape. Audio quality was also strong. Music seemed full and bold, while speech was consistently natural and crisp. Effects became the most prominent component, of course, and packed a solid punch, with positive clarity and range. People invest major bucks in home theaters for flicks like this, and Rim delivered the goods. The Blu-ray comes packed with extras, and we open with an audio commentary from director Guillermo del Toro. He provides a running, screen-specific look at story/character areas, themes and tone, influences and inspirations, costume and creature design, various effects, cast and performances, music and audio, cinematography, and other areas. If I’ve ever heard a bad/boring commentary from del Toro, I can’t recall it. Instead, I find him to be one of the best filmmakers to discuss his work – heck, he might be the best director out there when it comes to chats like this. Del Toro fills his commentary with useful information and insights and does so with charm and wit. He makes the track a delight. Also on Disc One, 13 Focus Points fill a total of one hour, two minutes and 26 seconds. In these, we hear from del Toro, producers Thomas Tull, Mary Parent and Jon Jashni, conceptual designer Tyruben Ellingson, production designer Andrew Neskoromny, visual effects supervisor Jaime Price, ILM modeling and texturing supervisor Dave Fogler, ILM VFX art director Alex Jaeger, ILM animation supervisor Hal Hickel, effects supervisor Shane Mahan, writer Travis Beacham, makeup department head Jordan Samuel, executive producer Callum Greene, supervising art director Elinor Rose Galbraith, cinematographer Guillermo Navarro, special effects coordinator Laird McMurray, composer Ramin Djawadi, and actors Charlie Hunnam, Charlie Day, Rinko Kikuchi, Idris Elba, Ron Perlman, Burn Gorman, Rob Kazinsky, Max Martini, Heather Doerksen, Robert Maillet, and Diego Klattenhoff. The “Points” look at del Toro’s impact on the production, Kaiju and Jaeger design and bringing them to life via effects, story/character topics, cast and performances, sets and various visual design elements and music. Overall, the “Points” deliver a decent look at the film. They tend to be somewhat fluffy and superficial, so they definitely don’t compare with the depth and meaning found in del Toro’s commentary. Still, we learn a fair amount from them, and the addition of behind the scenes footage bolsters them. Disc One opens with an ad for Seventh Son. No trailer for Rim appears here. When we head to Disc Two, we find The Director’s Notebook. This interactive feature consists of video pods, concept art and text translated from del Toro’s actual journal related to the film. We find five screens of text, six pods, and three collections of art. All are good, but the pods fare the best. They tend to focus on minutiae, and that makes them fascinating, as they reveal layers to the film’s design that otherwise might go unnoticed. I don’t much care for the awkward interface of the “Notebook”, but it delivers good content. A few featurettes follow. Drift Space goes for five minutes, 24 seconds and offers a closer look at the film’s characters. It gives us text details about Raleigh, Newt, Mako, and Herman. This becomes a fun little addition that fleshes out the roles in a nice manner. Under The Digital Artistry of Pacific Rim, we get a 17-minute, 10-second piece with del Toro, Jaeger, Fogler, Hickel, ILM visual effects supervisors John Knoll and Eddie Pasquarello, and ILM digital modeling supervisor Paul Giacoppo. “Artistry” looks at the film’s visual effects with an emphasis on how del Toro interacted with the process. That gives the featurette a different feel and makes it more interesting – and less technical – than most of its ilk. An archive called The Shatterdome breaks into two areas. 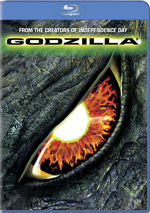 “Animatics” covers five sequences, while “Concept” gives us art for a mix of Kaiju, Jaegers, costumes and environments. The animatics fill a total of nine minutes, 56 seconds and show those scenes via drawings. The 29 concept art areas present a total of 251 frames and let us see the notions in various stages. All are valuable to observe. Four Deleted Scenes go for a total of three minutes, 45 seconds. We find “The Wall of Life/Rations” (0:46), “Excuse Me” (1:01), “Theft” (0:28) and “’Catch You In the Drift, Dad’” (1:29). “Rations” shows the food allotted to workers on the wall, while “Excuse Me” lets us see a little disagreement between Raleigh and Newt. “Theft” shows pilfering Newt does to aid his quest, and “Drift” depicts a spat between the Hansens. All are watchable, but only “Drift” would’ve added any substance to the final film. Finally, a Blooper Reel lasts three minutes, 52 seconds. As expected, it provides the standard assortment of goods and giggles. It’s nothing memorable, but at least it’s reasonably short and doesn’t overstay its welcome. Charlie Day also throws out a few funny improv bits, so those add value. The set also includes a DVD copy of Rim. This offers the audio commentary but lacks any other extras. Going into Pacific Rim, I hoped I’d get the best action film of the summer. Instead, I found an often dull, always predictable flick. While it occasionally showed some life, its many flaws meant it never became better than average. The Blu-ray delivers excellent picture and audio along with a solid collection of supplements. I’d strongly recommend this terrific package if only I liked the movie more than I do. As it stands, I can say genre fans might want to give it a look but they shouldn’t expect much from it.